Since the publication of a January 6 Geneva Believer story revealed claims by seven employees contradicting Finger Lakes Health’s assertions about the closing of the mental health unit in Penn Yan, two local media outlets have picked up the story, while community members have begun organizing to fight the closure. While Finger Lakes Health continues to assert that the closure will not occur without the state’s approval, their job listings, applications with state agencies and communications with employees tell a very different story. After the December announcement that the Inpatient Behavioral Health Unit at Soldiers and Sailors Hospital in Penn Yan would be closing pending state approval, some staffers left to find new jobs, as they were given the impression that the closure was inevitable. While FLH spokesperson Lara Turbide has made several public statements that the closure would only happen with state approval, the organization’s actions show that they plan to close the unit no matter what the state says. Shortly after the January 6 Geneva Believer story was published, employees say that management told them the unit would close on February 16th, regardless of whether or not the state approved the closure. Employees were informed that the current psychiatrist would be departing on that date, leaving the unit without a psychiatrist, forcing its immediate closure. The employees were also told that FLH was having trouble finding a new psychiatrist (either permanent or temporary) to fill the position. Of course, the effort to hire a new psychiatrist or any new staff was made far more challenging by FLH’s public announcement in December that the unit was slated for closure. Why would a doctor or health care worker want to relocate or endure a lengthy commute if the job is not permanent? 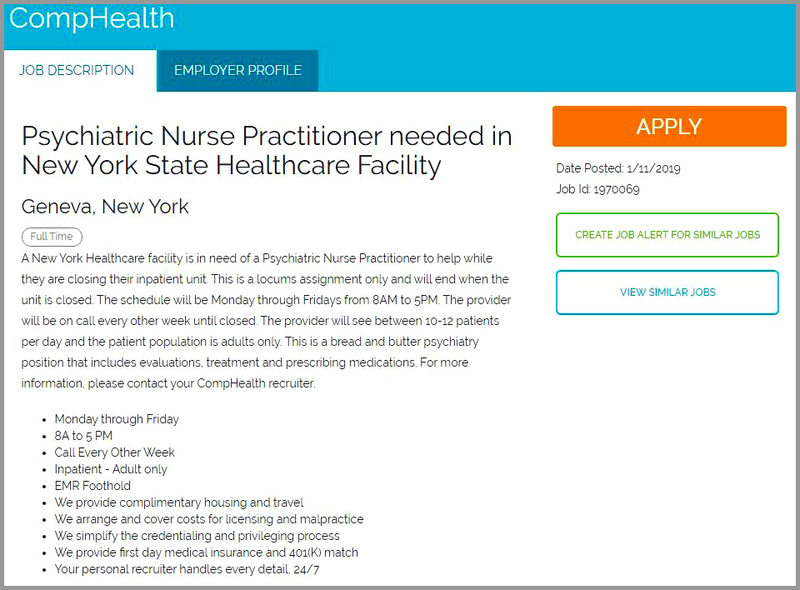 A job posting for the position from January clearly indicates that they are hiring a “temporary” full-time psychiatrist, even though the state has not approved the unit’s closure. Also posted in January is a job listing for a Psychiatric Nurse Practitioner which is even more explicit in asserting that the unit will close. If the unit is only slated to close IF the state approves the closure, as FLH is asserting publicly, then why are they telling employees and placing job postings stating that the unit WILL close? The timeline of FLH’s actions certainly points toward a conscious effort by the organization to encourage current staff to leave the unit and find other jobs, while discouraging job seekers from applying for jobs on the unit. At the end of December, Finger Lakes Health officials claimed they had begun the process of closing the Inpatient Behavioral Health Services program at Soldiers & Sailors Hospital in Penn Yan. However, a search of the New York State’s Department of Health’s Certificate of Need Applications reveals that Soldiers & Sailors did not submit an application to the State to close the unit until January 28th. This has resulted in massive confusion for employees, patients and community members. Hospital employees were told that the unit would close on February 16th and many nurses have already left the unit; however, the closure has not yet been reviewed or approved by state regulatory agencies. Why would Finger Lakes Health announce the pending closure of the unit on December 20th and claim that they had begun the process of obtaining state approval to close the unit, when they did NOT actually begin that process until more than a month later on January 28th? On January 29th, a community meeting was held in Penn Yan to address the threatened closure of the mental health unit. Residents noted that over the last several years they have observed a pattern of defunding at Soldiers & Sailors, cutting personnel and essential services well before the closure of the mental health inpatient unit was proposed. Residents insisted that the closure is a move in the wrong direction for a community already suffering from acute mental health crises. “Rather than closing down the mental health unit, the hospital should be investing more resources in the unit, so it can serve the community better,” one meeting attendee noted. “Mental Health services shouldn’t be about making a profit, they should be about keeping our community healthy and safe,” another resident continued. The next “Community Meeting On Mental Health” will be held on Tuesday, February 5th, 5:30pm at 111 Elm Street in Penn Yan. Click here for more information on the meeting. Finger Lakes Health officials have proposed closing the inpatient mental health unit at Soldiers and Sailors Hospital in Penn Yan. While officials have made the closure sound like a done deal, their application to close the unit has only recently been submitted. The public comment period is still open. Unit patients and staff, mental health advocates, and the Penn Yan community are asking us to write to the Department of Health and register public comment. The unit should remain open and should be provided with the hospital staff and support services necessary to deliver quality care. Patients testify to the benefits of receiving mental health treatment near their families, in their community, and close to their follow-up care, from a stellar nursing staff who knows them and cares about their recoveries. At a bare minimum, the Department of Health must delay their decision long enough to consider the impact the proposed unit closure would have on our region and hear from the public about the proposed closure’s impact. You can also join the Call to Action on Facebook for more information! I am writing to express my concern over reports that Finger Lakes Health is shutting down the inpatient mental health services department of the Soldiers and Sailors Hospital in Penn Yan. My understanding is that this shut down is being rushed without following the appropriate process. There has certainly been no public discussion or opportunity for public input into a decision that impacts people throughout the area. Given the stresses that lead to suicide, substance abuse, and increasing incidents of mental illness, the thought that our community would be denied basic services is very upsetting. Please slow down this process so that there can be a comprehensive study of local needs and full and open discussion with the whole community.